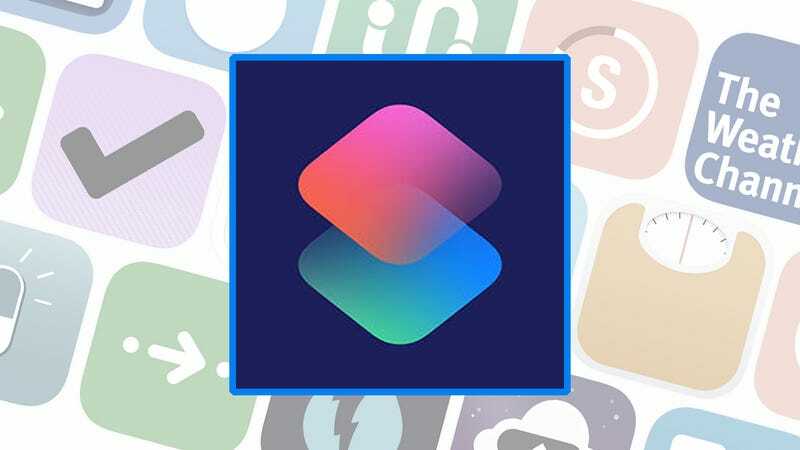 Announced as part of the iOS 12 update and now available as a separate app, Siri Shortcuts (or just Shortcuts) lets you do more with Apple’s digital assistant—you can wrap up a bunch of different tasks and launch them with one voice command. If you’re not sure exactly how this can be of use, keep reading. The free Shortcuts app is based on Workflow, the automated task app that Apple picked up in 2017. The idea is to allow anyone to set up simple scripts for apps and for iOS to follow, with no coding or hacking required. Just tap on a few apps and actions, and you’re up and running—it’s a little like IFTTT (If This Then That). Once you’ve got the app up and running on your iPhone or iPad, you can create shortcuts by tapping the Create Shortcut button on the Library tab. Switch to the Gallery tab to see some examples you can use, provided by Apple. Finished shortcuts can be launched through Siri, through a widget on the Today View, or through the app itself. Heading to work? Set up a Siri shortcut for the daily commute. Pick Get Current Weather to return the weather at your current location, then Speak Text to have your phone read it out to you, just so you know what you’re facing. You can then add a Street Address (your office) and pass that address into Show Directions to bring up directions to work (hit Go to start the navigation). For a final flourish, use Get Playlist to select your favorite commuting songs, then Play Music to queue them up. Heading home from work? Siri shortcuts can help at the end of the working day too. Choose Street Address and input your home address, then Get Travel Time to work out how long the journey will be. You can pass this to a Send Message action to tell someone at home how long you’ll be. Choose your recipients, compose the message, and you should see Travel Time appear as a variable you can insert. Feel free to queue up some songs as before, or turn up your smart thermostat at home—if it’s cold enough and you’ve got a device that works with the Siri shortcuts API. Siri shortcuts work well with the Photos app on your phone. To pick photos, you can use either Get Latest Photos to select a specified number of images in chronological order, starting with the newest, or Select Photos to pick them manually. You’ve then got all kinds of options, from cropping to converting to GIF-ifying. Here we’re concerned with resizing: Pick Resize Image and specify your width and height values as needed. If you’ve got other photo apps installed that work with shortcuts, you might have some more advanced resizing options to pick from. Another way Siri shortcuts can be useful is with notifications and alerts. Pick Show Alert and you can get a message of your choice up on screen—like “grab your toothbrush,” for example. Follow that with a Wait block, then input 60 seconds for the wait time, and use Show Notification to let yourself know a minute has elapsed. Add another 60 seconds wait (obviously adjust these depending on how long you want to brush your teeth for), then add another Show Notification to say time is up. You can also use Vibrate Device to do just that, and you have the option of playing sounds alongside your notifications too. Whether you’re getting pulled over by the police or your kid is doing something cute—the full gamut of emotions and scenarios—you can set up a shortcut to start a video recording and block out distractions with a voice command. Take Video is the action to use here (you can choose from the front or back camera, and have recording start immediately). You can then add Save File to save it to iCloud or Dropbox right away, with no other input necessary besides stopping the recording. As with all these shortcuts, you can tweak and adjust it as required. Use the Set Do Not Disturb block, for instance, if you want to make sure you don’t get any interruptions while the video is recording. If your favorite website supports RSS, plug the RSS URL into Get items from RSS Feed and set the number of items to something manageable, like five. Follow that up with an Open URLs action and you can get the most recent stories loaded up into Safari in separate tabs whenever you run the shortcut. You can also use Speak Text to have the latest news headlines read out to you, rather than loading them up in Safari, but how well this works really depends on how the RSS feeds from your chosen sites are structured. Shortcuts give you deep access into the settings of iOS, which means you can configure multiple options at once without having to dip in and out of multiple menus. Let’s say you want to configure an “ultimate” Do Not Disturb mode, for example. You can use Set Do Not Disturb to turn DND on, for starters, then follow that up with Set Airplane Mode to turn off all connectivity options. Set Volume will let you set the volume level to the very lowest point too. For the finishing touches, you could add Set Brightness to dim the screen and Set Low Power Mode to put your device into a sort of hibernation. Whatever combination of settings you want to apply, you can make a shortcut for it. Another handy way of making use of shortcuts is to share your location. If you pick Get Current Location for the first action and then follow it up with Copy to Clipboard, you’ve got text of where you’re currently at that you can paste into any email, conversation, or other app. You can set an expiry time for the text, and of course pass it into any other app as well, if you want to. Thanks to the universal clipboard feature of iOS and macOS, you can even paste this text on another device (if you want to keep the text local, the shortcut lets you do that). We’re not going to go too deep into the rabbit hole of shortcut scripting here, but this will show you how it works: If you pick Get Battery Level and then follow it with an If block, you can take actions based on how much juice your device has got left. So, you can use Set Brightness to keep dimming the phone as the battery level goes down, turn off Bluetooth and wifi, and so on. That’s just a simple example script, but by passing variables back and forth you can create some complex automated shortcuts that react automatically to something that’s happened. If you pick Find Calendar Events Where as an action, you can get shortcuts to look for upcoming appointments in your calendar—for the next day, the next week, or whatever. You can even specify which calendars are to be queried. iOS file support is gradually getting better and better with each passing year, and you can make use of a shortcut to collect a bunch of files together in one zip archive that is then emailed to the contact of your choice. You need the Get File, Make Archive, and Send Email actions for this, in that order, and there are a host of options to pick from along the way—which file service you want to use, the name of your archive, where the email is going, and so on. You can prompt for certain values each time (like the archive file name) if you don’t want to set them automatically. To show you how you can take your shortcuts to the next level in terms of complexity, we’ll take you through one of the sample shortcuts you can find in the gallery: The Image of the Day one for NASA’s feed of daily pictures. It starts off with Get Items from RSS Feed—with one item fetched and http://apod.nasa.gov/apod.rss the values—and that’s followed by Get Contents of Web Page and Get Images from Input (you can see how this could be adapted to get and process pictures from almost any source). Next, the Quick Look action shows the picture on screen, and that’s followed by a Choose from Menu block: This block, as its name suggests, lets you create a custom menu using a selection of preset options. Here, Save image and Share are the choices. After a menu block, the shortcut branches, so it can respond to whatever the user selections. In this example, the actions Save to Photo Album or Share (which just brings up the share sheet) bring the shortcut to an end.